Trump and Tillerson apparently disagree on Qatar. Qatar indeed supports ISIS and other terrorist groups. Expressing US support for Saudi Arabia, a family dictatorship, Trump ignored the epicenter of regional proliferated terrorism – along with Israel, other regional rogue states and America’s presence. He was silent about Saudi public whippings, beheadings, torture, political prisoners, inequality and violence against women, along with other horrendous civil and human rights abuses. He oozed praise for his Saudi hosts, sealed a $110 billion arms deal, signed a memorandum for around $350 billion over the next decade – to be used for aggression, homeland repression, and proliferating regional terrorism. His first two foreign destinations were Saudi Arabia and Israel – the region’s most appalling regimes, allied with America’s war OF terrorism on humanity. During his Riyadh visit, Trump called Qatar “a crucial strategic partner.” Back in Washington, he accused the Gulf state of funding terrorism. This week, a deal was reached to sell Qatar F-15 warplanes, costing around $12 billion. 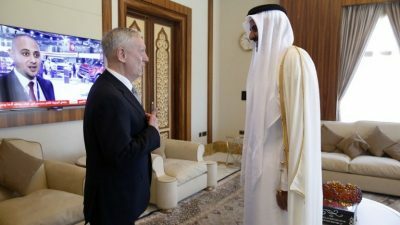 According to Reuters and Bloomberg News, Defense Secretary Mattis finalized it during a Wednesday visit with Qatari officials. Before Saudi Arabia and other neighboring states severed ties, Congress approved the sale of 72 warplanes costing $21 billion. Praising the consummated deal, the Pentagon said it “strengthen(s)” bilateral defense ties in the battle against “violent extremism and promote(s) peace and stability in our region and beyond” – notions both countries consider anathema. Qatar hosts Washington’s largest regional military base. Days after Trump accused the country of funding terrorism, two US warships arrived in Doha to take part in joint military exercises with its navy. Mixed messages from Washington make it unclear what its position is on the Gulf state.